They're very different companies. Which is the better buy right now? Love it or hate it -- and for most investors, there's no middle ground -- Tesla (NASDAQ:TSLA) has been the most talked-about auto stock for years now. The company's shares have had a great run, but right now, Tesla seems to be at a crossroads. 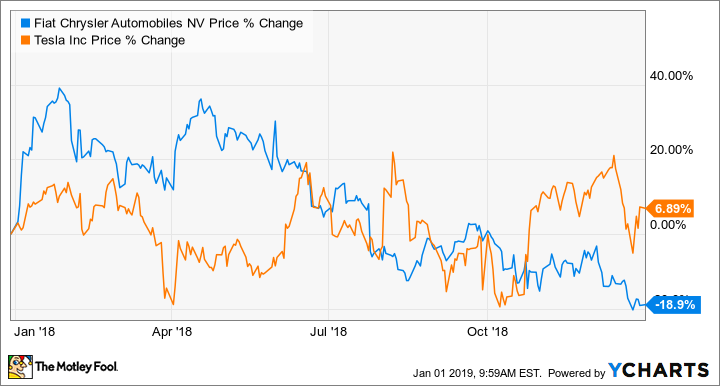 Among "legacy" automakers, Fiat Chrysler Automobiles (NYSE:FCAU) is one that has drawn quite a bit of investor interest recently, thanks to a very strong third quarter that left many with a sense that Fiat Chrysler (FCA) is on an upswing. It's a question that would have seemed absurd to many investors two or three years ago, but I think it's worth asking now: Which is the better buy today? Global demand for SUVs has been white-hot, and FCA's Jeep brand has taken full (and profitable) advantage. Image source: Fiat Chrysler Automobiles. Like most of the global automakers, Fiat Chrysler had a rough 2018 in the stock market. While FCA's shares didn't fall quite as far as some rivals' (Ford Motor Company, Honda Motor, and BMW were all down more), its share price has dropped about 19% over the last 12 months. FCAU data by YCharts. Chart shows the performance of both stocks during the 2018 calendar year. Tesla's stock followed its own path in 2018, ending the year up almost 7%. But the stock's extreme volatility makes it hard to draw much of a conclusion from that: If the year had ended a week earlier, Tesla's stock would have been down 5% in 2018. The traditional valuation measures don't give us much to work with, either. While it's somewhat useful to know that FCA is trading around 6.2 times its earnings over the last 12 months, Tesla posted a net loss over the same period. In fact, while Tesla has managed a small quarterly profit here and there (most recently last quarter), the company has yet to report a full-year profit. The truth is, while both Tesla and FCA are automakers, they're very different kinds of companies from an investment perspective. FCA is a solidly profitable mass-market automaker with vast global operations and significant share in the U.S., European, and South American markets. Tesla is best thought of (at least right now) as a boutique producer of upscale electric cars for tech enthusiasts that has yet to prove it can ever be sustainably profitable. And yet Tesla's market cap is roughly two and a half times FCA's. What's the story? Almost seven years after its launch, Tesla's big Model S still looks cutting-edge. Even most Tesla bears will agree that the Model S will be remembered as an all-time classic. Image source: Tesla. FCA's growth story is a pretty good one. A product-line revamp and the global expansion of the Jeep SUV brand are boosting the company's margins, while its once-worrisome debt load has been brought down to manageable levels. During FCA's annual capital markets presentation in June, CFO Richard Palmer said that if all goes well, the company's earnings per share (excluding one-time items) could roughly double over the next four years as more new products come to market. But as good as it is, FCA's growth story can't hold a candle to Tesla's. As Tesla's most bullish fans see it, CEO Elon Musk is literally inventing the future -- of cars, of energy, of space travel, of tunnels, with more to come -- right before our eyes. "Tesla isn't an automaker" is a phrase that has become a running joke in certain corners of Twitter, but it's important to understanding the bull case for the company: Electric cars are just one component of Musk's expansive plan to lead humanity to a sustainable, high-tech future. How big could the company get? Morgan Stanley auto analyst Adam Jonas released a note in April of 2017 that estimated Tesla's eventual total addressable market at $15 trillion -- about 20% of the entire world's gross domestic product. Sure, Jeep sales are up 18% this year, but how can FCA hope to compete with that? The thing about Tesla is that while the story is an all-time great one, the reality of the company's situation today isn't quite so spectacular. Tesla will need a lot of money to get anywhere near realizing Musk's vision, and so far at least, that money isn't coming from car sales. While the company did eke out a profit in the third quarter, few think it has reached the point of sustainable profitability. The Tesla Model X's "falcon-wing" doors look cool, but turned out to be a headache to manufacture. Image source: Tesla, Inc. In fact, Tesla might be facing some trouble in the near term. Its cash is running low. And sales of its mass-market Model 3, while initially impressive, could be headed for a fall in 2019. Tesla's quality continues to be a significant concern (the brand placed last in an important United Kingdom quality survey published this week) as major automakers prepare to release a slew of competitive electric vehicles over the next couple of years. At this point, Tesla's vision seems awfully far-fetched. Assuming that it can get through the next year or two, I do think there's a real opportunity for Tesla to carve out a sustainable space as a niche maker of upscale electric vehicles. There might be a nice, profitable, sustainable business here: somewhere between 1 million and 2 million vehicles a year, generating something like $8 billion to $12 billion in operating profit every year. But that's not the vision that is baked into Tesla's current valuation, much less the expectations of its most bullish investors. Is FCA or Tesla the better buy now? As someone who has spent many years looking under automakers' financial hoods, I have always had a lot of trouble believing Tesla's story. Tesla's cars are innovative and different -- but they aren't years ahead of what the major automakers can produce, as the world is starting to learn. And Tesla's much-touted manufacturing "advantage" has so far turned out to be a significant disadvantage, as the company struggles to hit production rates and quality levels that would be routine for any major automaker operating in a similar factory. Next to the sleek Teslas, FCA's Dodge muscle cars seem to be relics of the last century -- and in some ways, they are. But it's no secret why FCA keeps them around: The Challenger and Charger are very profitable products with an enthusiastic following. Image source: Fiat Chrysler Automobiles. FCA has its own issues, of course. Its own visionary CEO, industry legend Sergio Marchionne, died earlier this year. New CEO Mike Manley capably led the Jeep brand for several years, but it's not yet clear how he'll do leading the entire company. And while FCA has some promising new products on the way, a global downturn seems increasingly likely, sooner rather than later -- which could delay that targeted profit increase for a while. Tesla is still a moon shot: It might yet pay off big, but there's a long and growing list of concerns about the rocket that might keep it from ever leaving the pad. FCA will never be a moon shot, and it's probably a riskier bet than some of its global rivals. But if all goes well, it could reward investors with an outsized gain over the next four to five years. It comes down to this: Do you believe in Tesla's story? If so, buy the stock. But if not, you could do a lot worse than to take a closer look at FCA.